Why Does a Budgie Stretch His Neck With His Beak Open? When a budgie opens her beak and stretches her neck, she probably is about to regurgitate. In some scenarios, this is not a cause for concern, but in other scenarios, neck stretching and beak opening are a sign of potential sickness. In fact, these actions are part of the classic sick budgie look. The key to telling the difference is to consider the context and any accompanying symptoms. Budgie females feed their chicks by partially digesting, then regurgitating food for them to eat. Right before she regurgitates, she’ll stretch and strain her neck, sometimes using a “pumping” action using the neck muscles, which distinguishes it from the range of normal head and neck movements a budgie performs. If there are hungry chicks to be fed, the neck stretching and beak opening are not a cause for concern. However, if there are no chicks, or if the budgie is showing other signs of illness while trying to regurgitate, it’s time to consult a vet. When a budgie is sick, he may have dull eyes. A generally “puffed up” look is indicative of illness in most birds. Other symptoms that could indicate a sick budgie include lethargy, poor balance, listlessness and loss of voice. Budgies are native to Australia and are quite used to high temperatures, provided humidity is low. But they can’t sweat, so they use the neck stretching method to remain at a healthy temperature. However, when sick, budgies perform neck stretching and beak opening. This is often the first sign of illness, as budgies instinctively try to conceal weakness so as not to attract predators. Pneumonia, fungal infections, viruses, parasites and metal poisoning can cause a budgie to display a sick look. Once you’ve eliminated the benign causes of neck stretching and beak opening, take your budgie straight to the vet. Budgies are fairly robust and can tolerate minor injuries and unpleasant ambient conditions without complaint. 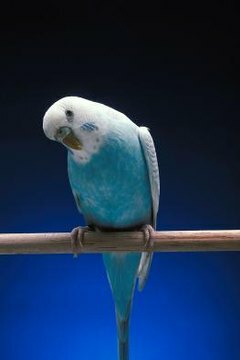 So when a budgie is showing visible signs of illness, it is typically an indicator that the budgie is already quite sick. There is no time to try home remedies. Hamilton and District Budgerigar Society: What is the Best Temperature for my Budgie?